These engine covers are one of the best investments I have put into my bike. I low-sided last weekend and the cover itself doesnâ€™t have a scratch on it at allâ€¦ the puck was pretty much ground in half. I'm buying a new $30 puck. Thanks for getting back to me. I've gone down four times with the cases on my 05 Gixxer 1K. The right slider is currently ground-up a bit, but not bad. Gonna replace it anyway. I've replaced it once before. I don't recall replacing the left side but I'm pretty sure I have. I believe I've ordered all my stuff directly through you guys, so you can probably look up how many sliders I've gone through. I have your engine cases on my (now retired) '02 R1 race bike as well. Beat the hell outta those things and they never did me wrong. Great stuff, I tell ya!!! I'll order the sliders online, shortly. (I just might go with the shorter 1"er). 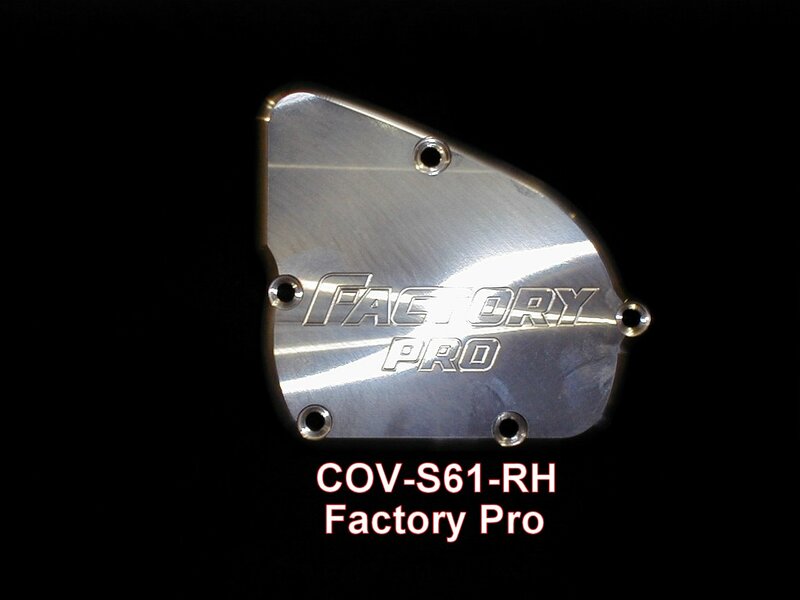 With Factory Pro Billet Covers: Spend a bit more, get unlucky and be a REAL USER or spend less and be a real non-winner (they told me not to write "LOSER") with plain billet engine covers. till you really use 'em! Here they are! Hidden at The End of the Internet! - These are "the covers with the frame sliders"! 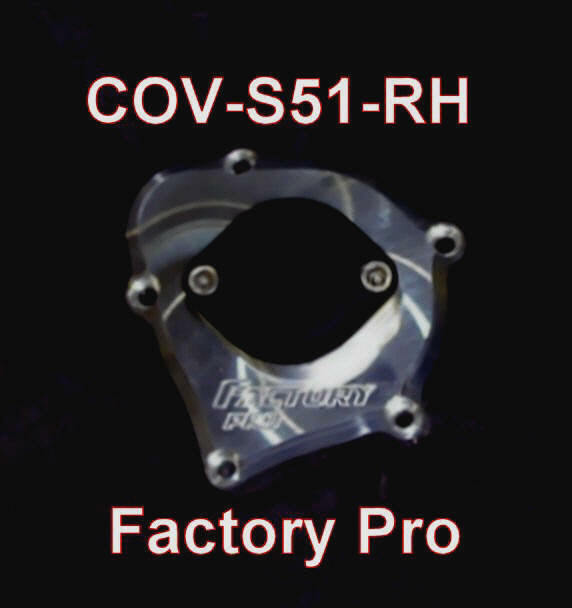 Factory Pro designed and patented - these covers are the ultimate in street and race protection. 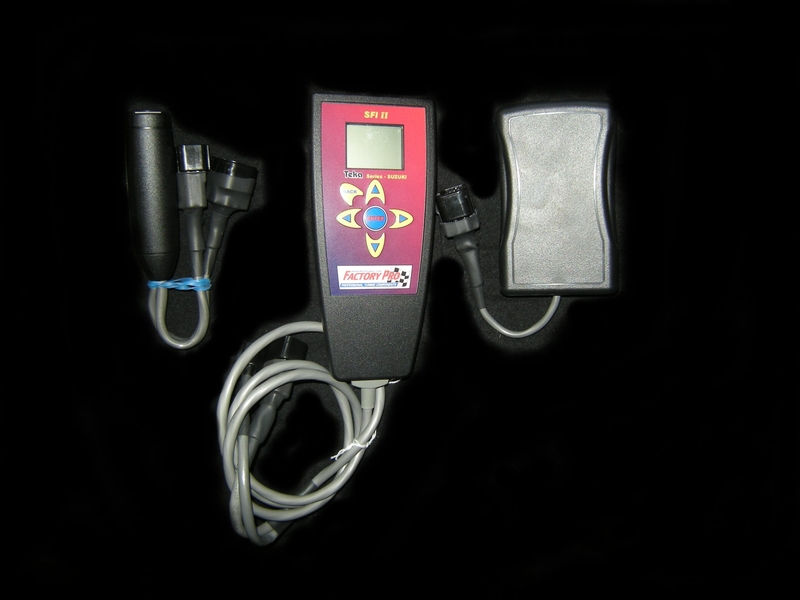 Factory Pro, USA leaders in quality tuning products and manufacturer of the famous F-USA rated EC997 Eddy Current chassis dynamometer. Optimum strength / weight ratio - lighter than most other billet covers. Maximum protection - Much tougher than stock cast engine covers. Polishes to a brilliant sheen! Countersunk stainless steel allen screws to prevent shearing. includes gaskets and stainless steel allen screws when required. 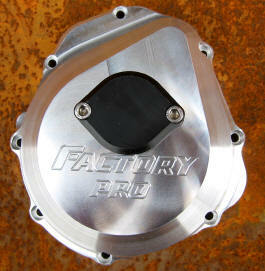 Factory Pro can license the frame slider design. Please contact us for information. As used by Suzuki Cup World Champion Robert Jenson and Team Vesrah - 2005 #1 USA Endurance. No fairing cutting required with slotted slider! Optimum strength / weight ratio. Much tougher than stock cast engine covers. includes gaskets and stainless allen screws when required. The only patented motorcycle cover in the world! Just thought I'd write to tell you I "used" the SV clutch cover I bought from you. Lowside at about 80 mph into the runoff at a trackday. Your product took some abuse but held up beautifully. Kept me going throughout the weekend. Good stuff, thanks! 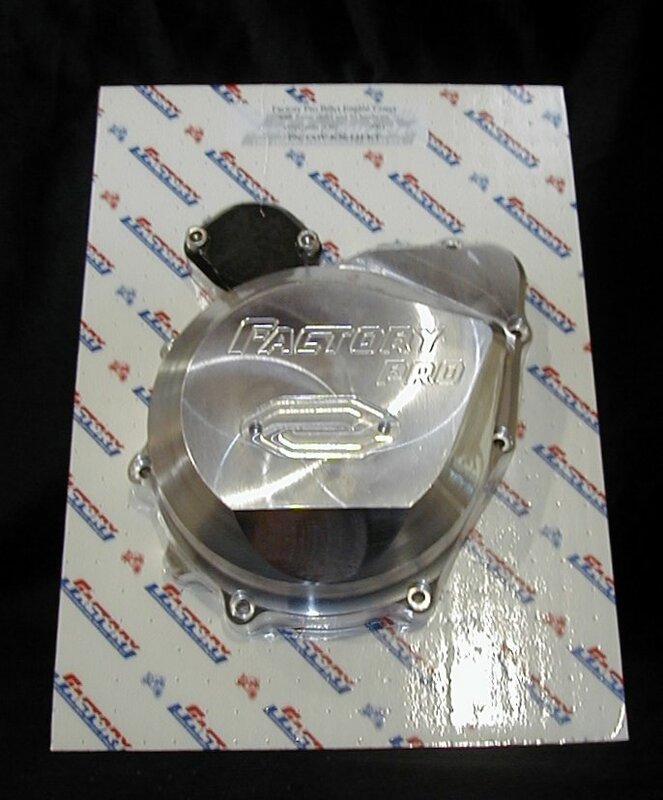 I ran Factory Pro engine covers on my rookie season in 2005 as a Novice rider with the CMRA. As you know us rookies tend to crash a bit more than others. I'm sure I'm not the first to say the covers and sliders ROCK! On several lowsides throughout the season the bike slid on the sliders and never once tumbled. I contribute this to the position on the slider on the bike. Friends with conventional sliders found the slider digging in and flipping the bike causing much damage. Needless to say, my season ended in one Championship and two 3rd places. CMRA seen fit to bump me to expert in 2006. I purchased two brand new GSXR's and have already installed Factory Pro covers on the one through RaceworX in Dallas. Unfortunately I had the chance once again on December 20th at MSR Houston to test them out. Once again they performed great!!!! The bike slid on the slider. Beside a few scrapes on the plastic the bike was not damaged. With this said I feel like I could represent your product with much confidence! If you offer a support program I would be glad to participate. As I said, I have already purchased a set for the Superbike. I'm only in need of a left side stator cover for the 06 GSXR 1000. Attached is a copy of my resume along with a rendering on the new paint scheme for the 2006 season. I feel the your product has saved me a ton of $$$$ in crash repairs over the past season. I have been on racer support with Factory Pro Tuning for 2 years now. I wanted to personally thank you again for the support you have given me for the 2001 season and also to inform you how well your products perform. I just completed the opening round of the CCS Midwest season at Gateway International Raceway. Unfortunately I had a get off at a little over 100mph. I had just installed the Factory Pro R6 engine covers with built in frame savers and they performed better than I would have ever thought possible. The only damage my R6 sustained was a slightly tweaked shift lever. Not a broken lever, bodywork, or anything. I rode the bike back to the pits and made my next session. I have already ordered a replacement bumper since mine was almost completely worn down. I will continue to recommend your products to anyone who will listen but have a new found appreciation for the incredible functionality of your products. 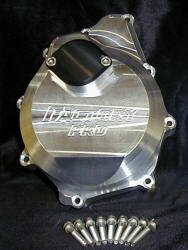 I am in need of LH cover w/ slider for a 2001 GSXR1000 race bike. Back to the purpose of the email. Texas/Oklahoma/ Louisiana area. Please send me a price on the cover and the lead time that I may expect once the order is placed. Do you have a racer discount or a Racer Support Program at this time? Please give me a shout when you get this. 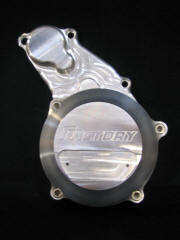 Factory Pro engine covers are the premier direct replacement for original brittle cast engine covers. Machined from solid billet aluminum for durability, then flycut to a gleaming finish. For racers - mandatory at many racetracks because they will help prevent oil leakage from all but the gnarliest of get offs! For street - absolutely beautiful addition to your engine - so nice you'll want to run without your fairing lowers! Don't confuse with less expensive cast covers. Coarse grain cast covers can shatter when struck - fine grain billet material is malleable, resisting cracking and shattering. "SKIDzz" stainless steel cover inserts are designed to take the majority of crash damage - conserving the alloy cover. "Bumperz" augment frame sliders. Made of synthetic material, they mount to the new yzf600 R6 covers for additional protection. For the sport rider they add the finishing touch to your custom sportbike. Stylishly flycut surfaces, carefully rounded corners, fully recessed stainless allen screws and carefully deburred edges. Beauty and Strength in coexistence. 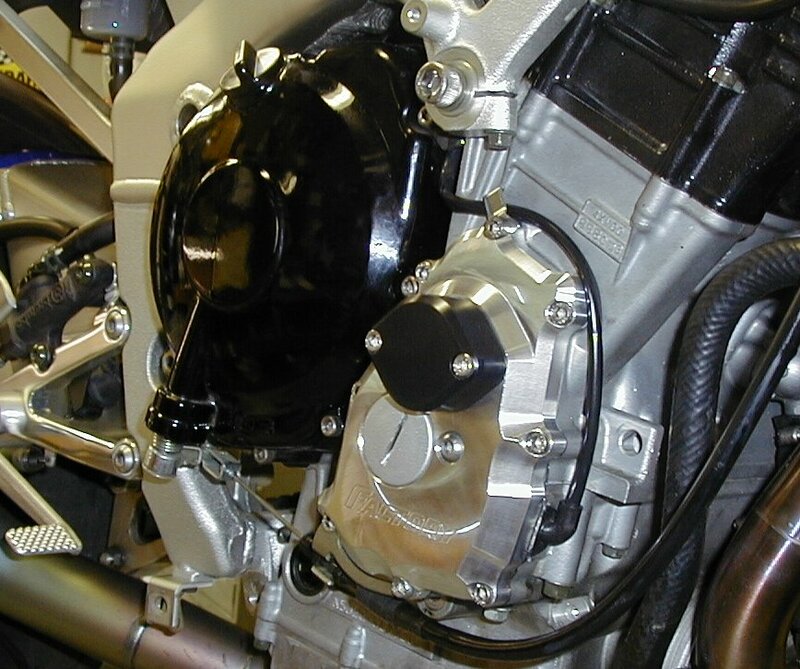 Are Factory Pro billet engine covers really that tough? "Only the Factory covers remained..."